Parking is available on the Santa Cruz Wharf for an hourly rate and is just a short scenic walk to our location. There are also small metered lots across the street as well. We are walking distance to many near-by hotels. The public bus stop is just across the street from Ideal Bar & Grill. We offer live music Friday & Saturday nights during the summer months and during special events throughout the year! Our Beach Room can host up to 40 guests. The room features a private bar, views of the wharf, beach and ocean. It also offers a small private patio (weather permitting) that extends the inside bar area, making it perfect for any event! 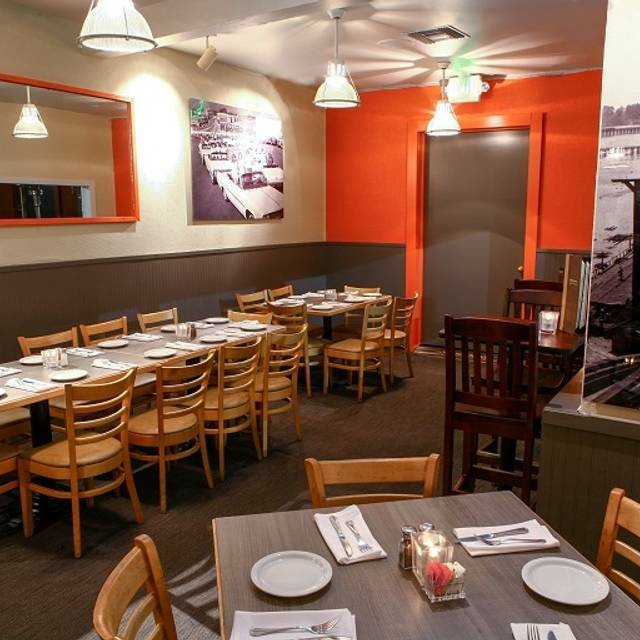 We have hosted various events here from rehearsal dinners, business meetings and wedding brunches to surprise birthday parties and charity events! 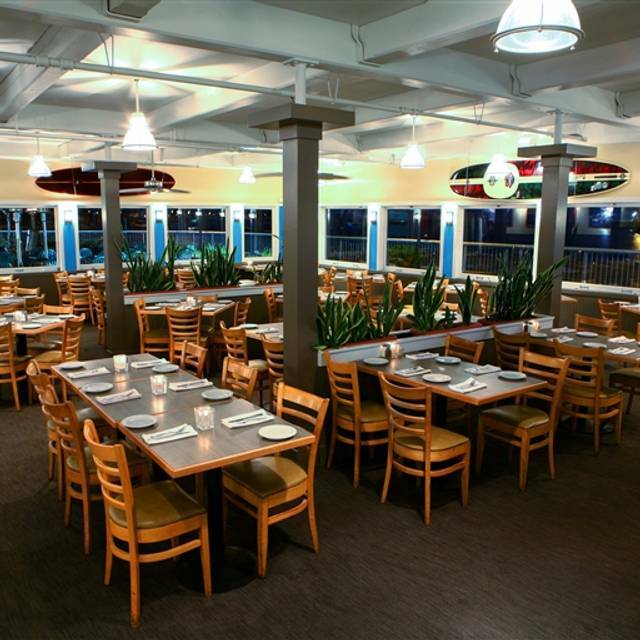 Fun, family friendly dining with a beautiful view of Santa Cruz Main beach and the Municipal Wharf! We offer seating both inside and on our sunny deck! Come down and try our award winning clam chowder today! 2016 Santa Cruz Chowder Cook-Off Best Professional Boston Clam Chowder 2nd pl. Ideal accommodated us with a party of 10 on a busy Saturday evening. Food terrific, service excellent. Weather outstanding!!! I have Been coming to Ideal for twenty years with my best friend for our March bday dinner special .... always looking forward to our meal and the view. But always dreading the service. THIS year was the best ever!! We had waitress JAYNA and she served us in the bar area at our favorite table. We were very happy with her and our experience at Ideal. Also I noticed at one point a group of employees high-fiving each other by the hostess desk. It was like a little cheer to have a great night at work. It was awesome !! Please please please keep up the good work!!! Nice restaurant on the water. The stuffed salmon and the calamari were great. Flavorful and large portions. The NY steak was unfortunately pretty bad. There was cartilage and fat all over it and it wasn’t seasoned. After cutting off a quarter of the size in “extra” bits, and adding salt, it was just ok. The waiter was very nice and the ambience was festive for the New Year. Really good prime rib. Cioppino tasted out of a can or frozen. Service better than it was at Thanksgiving. Veggies fixed well. Bread tired. I get better bread at my grocery. Enjoyed a very American afternoon lunch, we loved it. Very kind wait staff, food was good and most importantly, extremely family friendly. Our experience was at low season with minimal patrons. Either way, we will go back! Normally the food here is excellent. Got the Thanksgiving Turkey meal, but Turkey was dry and potatoes and gravy too salty. Nice ambience though. Won't be here next year for Turkey day. We come down for Thanksgiving every year. We can always get a nice spot outside. The service is great. For some reason, the weather is always wonderful on Thanksgiving, so we like to sit outside. The only thing that I do not like are the pigeons. The staff is quick to pick up the plates, but they always manage to swarm a vacated table. Sometimes they fly right over my head while I am eating. I think you need a couple hawks and an owl. GREAT for Xmas and Thanksgiving traditional meal. You can also order from the menu. Cheapest and tastiest for these two holidays. Unfortunately, the rest of the year, not so good. I don't know why they can't have as good food other times. I was assured that I could NOT get all dark meat. It was half light and half dark (said on the menu). My plate arrived all white. After complaining, I got a tiny amount of dark. Great food! Slow night but it was a great date or special occasion restaurant. Staff was not very accommodating, seemingly befuddled by very basic requests, and unable to problem-solve. That said, the spot is perfect, hard to go wrong with the view. Food was fine. Ideal is clean, comfortable, and relaxing. The menu is varied and service is prompt. A bit disappointing. Quality of food depends on what you order. My baked salmon was too dry, but the wife and daughter both enjoyed their Chicken Parmesan and fish dish. Island rice was excellent, and the baked potato fries very delicious. Our main problem was service. The waiter was a nice guy but not very attentive (and we aren't exactly high maintenance. Just check up on us once in a while.) Often he was too busy socializing with other waiters to notice us trying to get his attention. Eating on the patio was also a challenge since it was so dark. We took out our phones just to make sure the plates in front of us had what we ordered. 'Would probably not go back again - at least not to eat on the patio. The sea platter that I ordered as a main dish came first, I had to ask the waiter to first bring the clam chowder that I ordered and take the main dish back. Only five minutes later when I was only halfway with the chowder, the waiter came bringing the main dish again. Again I had to ask the waiter to take it back and wait until I had finished my chowder. I didn’t feel treated as a guest here. The kitchen was slammed, so the food came out later than expected. Overall, the restaurant is great. Unfortunately the experience was not good. Our server was fine and tried hard. But, the kitchen let her down and made us wait for substandard fare. This was our third visit and yet this is the one that we will remember and not in a good way. After waiting close to an hour for our food to arrive, the burger was over cooked and another dish was missing some additional items ordered. Ideal used to be my favorite place to go in Santa Cruz. The last few times I've gone, I have regretted making the effort. The service is slow, server pays no attention. Main course arrived before appetizers. Then for we were only comped for one of them. Menu is limited (compared to past visits). You go to eat on the beach, you want sea food... not seeing your favorites only offered once a week. And never on the weekend. We don't live in the area anymore. We traveled 400 miles for a weekend getaway. I have gone to Ideal for over 15 years. Sadly I have decided not to return again. Service was great from the minute we walked in to the minute we walked out. But the food was...amazing! My ten year old had the crab legs and said they were the best he's had(he has been eating them since he was 5 years old). This is a great place to eat, very comfortable too. Nice dinner in the evening, prime rib was outstanding! I thought the atmosphere ( laid back) and service was excellent at this waterfront restaurant. The ribs were the best I’ve ever tasted! A fine place but overpriced. Not unexpected given the location and convenience to the Boardwalk. Server was quite good though. The food was amazing and even though it was busy, the service was great! Everything was good. It was busy. The only thing I didn’t like was the oysters. I should have asked if they had mignonette...... they don’t. I had dinner here for my birthday and had made reservations for my 8 guests, myself included. I believe everybody loved their food and thought our waitress was quite professional. The food just isn’t that good. Weird seasoning on fish and chips, sea bass thin and dry. Mashed potatoes with chunks of skin ( regular potatoes not red or thin skinned). Food doesn’t seem to be the main concern. Anniversary was both checked and written in the table request but was completely missed or ignored. might try lobster night if we happen to be in SC on a Wed but otherwise, will probably not return. We had a great time. I share a birthday with one of my dearest friends. It has become a tradition, every year we celebrate together at Ideal Restaurant's birthday bash. With so many people in one place celebrating birthdays, as soon as you walk in the door, you feel the happiness. its festive without being too loud or irritating. The food was good, reasonably priced and the service was excellent. Ideal Bar & Grill hosts a Birthday Specials for those lucky people celebrating a birthday in any given month. My month was June and on the 3rd Thursday of the month is a free Birthday Prime rib dinner or 1/2 rack of baby back ribs. I had the prime rib which was great! You must buy and equal or lesser value entree. Great views, good for people watching and a must for the award winning Clam Chowder. Great casual place. Right on the beach, nice outdoor eating area. Close walk to Beach Boardwalk. Reasonably priced. Good Santa Cruz surfer beach atmosphere. We were delighted by good drinks and a perfectly cooked steak with an excellent crust and lovely King Crab which was cut for us so easy to get to. It was chilly outside but we sat under the heaters and enjoyed watching people go by. Breakfast special was good and a real bargain. we came down for our sons baseball game. i had to change my reservation 3 times due to the game prior to my sons and then his game. you were very accommodating...we finally got there and the food was delicious...great menu choice and great server!!!! Our server was kaitlyn . She was very nice , very friendly , great smile and awesome service . I will for sure be back to eat again . We celebrated my daughters 2nd birthday. Our server was super nice and helped us make her feel so special. The food was good and the atmosphere was perfect for beachside dining. Unfortunately, this night was a complete disaster!!! We have been going to this restaurant for years, at least 20 years that I can remember. Friday night is prime rib night, so I decided to have my birthday dinner there. Made reservations and everything was good to go, Until we sat down. No color crayons for kids anymore even though the kids menu has an activity page. The appetizers were so greasy and not very good, Dinner was ok for the adults. The food for the kids, my grandchildren was straight up disgusting. How in the world do you mess up a corn dog? Chicken nuggets?? They both tasted old, freezer burn, just absolutely horrible. I will say the service was absolutely horrible, we ordered drinks and had to walk to bar and get our drinks before our dinner was almost done. We will absolutely never go to Ideal again !!! Such a disappointment after years of being a faithful customer. Never again !! Food horrible, drinks not so good, service deplorable !!! First 10 minuets no one came to our table once they did he stopped and said I will be right with you then 10 min later with no drinks we walked out!! !